As the winner of the Mitchell 1 “Winter Escape to San Diego” sweepstakes, Jeff Knapp, co-owner of his family’s business, Knapp’s Service Center in Newburgh, Ind., along with his wife Laurel and son, Colton, flew to San Diego on Thurs., Feb. 6 to escape below-freezing temperatures and enjoy a long weekend in San Diego, including a VIP tour of the Mitchell 1 headquarters in Poway, Calif.
As the sweepstakes winner, Knapp won round-trip airfare for two people to San Diego and three nights in a double occupancy room at a four-star San Diego hotel, a rental car and $500 spending money. He was selected randomly from a pool of customers who used or upgraded to ProDemand™ during the contest period. Knapp’s Service Center was founded in 1971 and continues today as a successful family-run business. Knapp has been working in the shop since he was 14 and now does service writing and oversees the front-end of the business, while his brother runs the shop floor and their mother manages the accounting side. They are long-time users of Mitchell 1’s repair information and the shop’s technicians now often access ProDemand on their tablets. “They love the program and being able to be mobile,” said Knapp. ProDemand delivers complete OEM and experience-based information together in a single lookup. ProDemand with 1Search™ streamlines the search process by integrating data from the SureTrack™ diagnostic resource to provide comprehensive, categorized repair information in a user-friendly interface, making it easier than ever for users to find the complete information they need to repair vehicles accurately and efficiently. For more information about ProDemand, visit www.mitchell1.com/prodemand. 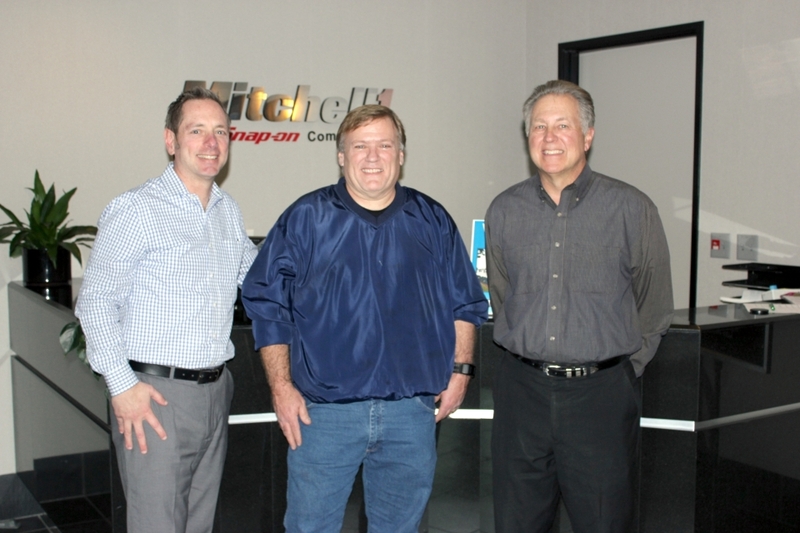 Nick DiVerde, Senior Director of Marketing, left, and Dave Ellingen, President of Mitchell 1, right, welcome Winter Escape Sweepstakes Winner Jeff Knapp to Mitchell 1. Next:Mitchell 1 to Hold This Year’s First Shop Management Workshop in Atlantic City, N.J.